This moment in time began somewhere in the early 1850s, as settlers were spreading into the foothills and taking up the pastoral runs allocated there. 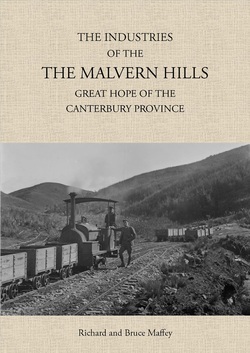 Following their exploration and settlement, there began a long period of agitation and expectation for rail communication across the plains to the Malvern Hills, where coal was to be found in addition to the promise of much economic wealth and employment. This ultimately culminated in the construction of a railway which hastened the settlement and opening up of the district, somewhat earlier than might have been the case. Had that promise been rewarded? Those at the forefront of the debate are long since departed, so their judgement cannot be known, but their foresight and legacy enabled many livelihoods to be maintained and enhanced by the benefits and employments of the railway and the industries it supported – coal, lime, clay, pottery and sand. In an age when rail was giving way to road transport, there was inevitability about the decline and closure of the branch line, eighty-six years after its inception. The industries it supported have run their course as well, but in an age of urgency and vitality, men of vision and courage saw great opportunity in the early Canterbury settlement - overcoming the obstacles of distance and terrain to build a network of rail connections, mines and engineering works to open up the foothills and bring much economic benefit and pre-eminence to the Province. 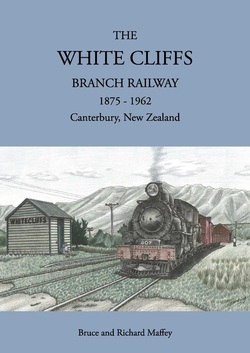 In 1962, after eighty-six years’ service, the branch railway to White Cliffs was finally closed and dismantled. Its passenger service had ceased thirty-four years earlier, leaving the line ‘goods only’ in its later days, except for the popular excursion trains which gave the public opportunity to enjoy the much loved Malvern Hills, so close to the city. Commercially, those who mourned the line’s eventual demise were those who had supported traffic on the line to the end; the proprietors of the Glentunnel Pipe Works and the Coalgate coal mines. For the convenience it offered, most of the farming community had turned to road transport for their produce and stock. By 1960, the line was already in poor condition, having received only minimal maintenance over many years through a Railways Department directive determined to close branch lines in order to save money. This line had however, been responsible for helping to open up the prosperous Malvern Hills area for settlement and agricultural development. The volume of sheep, cattle and grain traffic was a testament of the area’s new found wealth supporting this, the busiest branch line in Canterbury. In the nineteenth century, the supposed abundant mineral wealth and richness of the local coalfield raised high hopes of Coalgate becoming the centre of an English industrial ‘Midlands’, surrounded by well populated townships. This proved disappointing and the villages along the line failed to develop and prosper. In 1962, the junction at Darfield, which became the Malvern County’s administrative seat, was still a small rural township where almost all rail traffic was to and from the West Coast. The Malvern coal with its broken seams of predominately brown coal was found to be a limited field of inferior quality, compared with the large rich deposits of the West Coast accessible via the Otira Tunnel after 1923 - this ultimately proved to be the real ‘Gateway to the Coalfields’.